A natural and difficult tension exists between a project team (supply) and its customer (demand); a professional ScrumMaster relaxes this tension using the Scrum framework so that the team arrives at the best possible outcome. The Professional ScrumMaster’s Handbook is a practical, no-nonsense guide to helping you become an inspiring and effective ScrumMaster known for getting results. This book goes into great detail about why it seems like you’re fighting traditional management culture every step of the way. You will explore the three roles of Scrum and how, working in harmony, they can deliver a product in the leanest way possible. You’ll understand that even though there is no room for a project manager in Scrum, there are certain “management” aspects you should be familiar with to help you along the way. Getting a team to manage itself and take responsibility is no easy feat; this book will show you how to earn trust by displaying it and inspiring courage in a team every day. The Professional ScrumMaster’s Handbook will challenge you to dig deep within yourself to improve your mindset, practices, and values in order to build and support the very best agile teams. Stacia Viscardi is an Agile coach, Certified Scrum Trainer, and organizational transformation expert, devoted to creating energized and excited teams that delight their customers and inspire others. With humble beginnings in Port Arthur, Texas, Stacia found her niche as a Manufacturing Project Manager in the early nineties; she landed in the technology world in 1999 and never looked back. 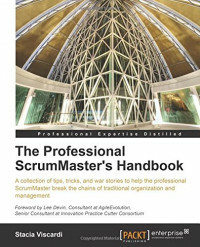 In 2003 she became the sixty-second Certified ScrumMaster (there are now over 200,000! ), and founded AgileEvolution in 2006. She has helped companies such as Cisco Systems, Martha Stewart Living, Primavera, DoubleClick, Google, Razorfish, MyPublisher, Washington Post, and many others find their way to agility. Co-author of the Software Project Manager's Bridge to Agility, Stacia has taught Agile in 17 countries and is active in the ScrumAlliance as a CST and trusted community advisor. If you're good with C++ and object oriented programming, this book utilizes your skills to create 2D games using the Simple DirectMedia Layer API. Practical tutorials include the development of two wickedly good games.